← City of Milan wins prestigious transport award. The Bletchley Park Trust is to fund an educational ‘Turing Education Officer’ role at its site in Milton Keynes and will support teaching experiences for young and disadvantaged children. This is the third such position created at the Trust in the past two years, and the organisation said that it could afford to fund the role for three years. This latest hire, once installed, will work on educational efforts for primary school children and disadvantaged and special needs students. According to the park people, Bletchley’s code breaking pedigree is just one facet of the experience. The education team at Bletchley has been hugely successful in this. In fact, so successful that the schools programme has been sold out many months in advance for the last few years. 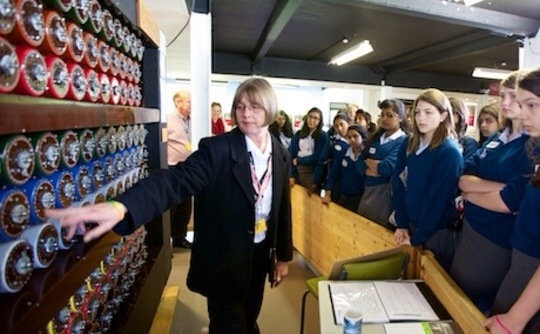 Bletchley says that it pulls in some 8,000 schoolchildren a year, and welcomes its place in science and technology learning. It added that it is looking to double the amount of young visitors. This entry was posted in IT and tagged Alan Turing, Bletchley Park, chrismacgowan, christopher macgowan, codebreaker. Bookmark the permalink.